It was a popcorn lid..not a Frisbie pie tin. 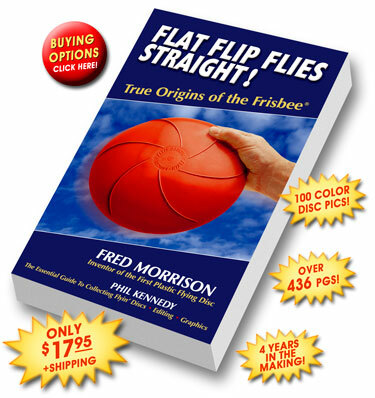 • 1937 : Fredrick Morrison got the inspiration for the iconic toy that would become the Frisbee at a Thanksgiving family picnic, tossing the lid of a large popcorn tin back and forth. • Date Unknown: Meanwhile, back in Southern New England, the activity of sailing disc-shaped objects on several college campuses became known as "frizby" or "frisbie," quite possibly because throwing pie tins from the Frisbie Pie Company (with an outlet near Yale) was best-known. • 1957 : Morrison sold the rights to his Pluto Platter to Wham-O, which renamed the flying disc the Frisbee. 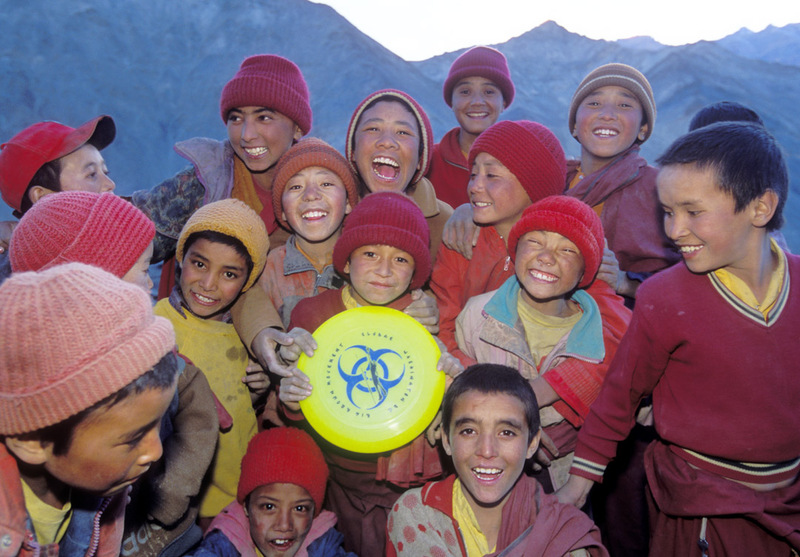 • 1969 : High school students from Maplewood, N.J., bent the rules from a game of catch and invented Ultimate Frisbee. The Ultimate Players Association was formed 10 years later to support the sport. Sludge's online presence is felt with an update to Sludge's Web Site page - its one [& done] posting. Caption: Feel the Joy of Playing Ultimate Frisbee at a Very High Level! A: Rob is in Dubai. Matthew supplies the end-o-season photo &...caption. So this is what 0-3 looks like? Sludge goes Oh-Fer, while a Sludger goes Four-Oh. We neglected to abuse Russ enough for passing the big 4-0 this week. Luckily, the lovely Elisabeth and Charlotte Rose and Amelia found their way to pickup on the Washington Monument grounds complete with candles in the wind and delicious cupcakes to help honor the occasion. Sadly, Russ's game has slipped now that he has passed the big 4-0 with repeated drops and unsuccessful throws. So, rather than pile on, perhaps we should all forgive him.....because that's the kind of guys and gals we are???? Luckily, I informed him of the multiplier effect (if you game has fallen to 25%, you just multiply it by your age to get a perfect 10!, so everyone please start increasing your tolerance of his deteriorating skills and decrease your expectations on (and off) the field. Sadly, several of you did not receive the party favors of Sunblock (SPF 30 - still living in the past obviously) with a color photo of Russ attached and the motto "safety first" emblazoned on there. Luckily, we do still have Russ Lamotte to kick around for a little while longer, at least. God Bless Russ and God Help Elizabeth! Kelly has a broken right finger on her left right hand which may require some outpatient surgery next week. The injury occured from a valiant layout during last week's Tourney. A young person went to their doctor complaining of pain. Where are you hurting? asked the doctor. You have to help me I hurt all over said the person. What do you mean all over? asked the doctor. Be a little more specific. The ailing person touched their right knee with their index finger and yelled OWWW! that hurts. Then they touched their left cheek and again yelled OUCH! That hurts too. Then they touched their right earlobe; Ouch even THAT hurts they cried. The doctor checked them thoughtfully for a moment and told the person the diagnosis -- you have a broken finger. First up in a tough draw was a second chance against these x-A-Leegers. Sludge eventually showed up. Sludge played well in the first half, except the number of Sludge turnovers were greater than points. Plus CHOMP’s burned holes through Sludge’s D. Sunscreen was the initial culprit for the TO’s, but overall change was demanded with Sludge down 6 at half. Would the 2nd half convert into Benchmarks? OR a just a Bench? What took place was a well coined SLURGE -- a gutsy we-could-still-WIN-this attitude. David hammered down a beauty cross-field score; MJ easily found ways to get open; Joe displayed slight of hand defense; Gayle fantabulously bee-lined her cuts; CH had a hot defense-makes-offense point; Kelly always beat her defender as Nigel ran circles around his; and Matthew shed blood for this team! The glimmer of victory vanished as quickly as Mister Mike Fisher’s appearance. The point cushion was just too much to overcome and Sludge lost by 5. The second game was versus Sludge’s arduous foe Durty Luvers. This was a rain check game since Sludge escaped playing DL during the season. Immediately, Sludge found themselves dirty dancing (20th anniversary of the movie, hey-o!) in a highly contested first half on a very dusty field. With Sludge +3 at half, everyone was feeling pretty, pretty, pretty, pretty good. Sludge was hangin’ in the shade, gorging on delicious snacks, contemplating the role of green beans at a Frisbee game, and straightup chilling. Good to Go right? Our backs are against the wall. When phrases like these fly, you know someone's suggesting for an escalation. 10-7. By 10-10, "110%" made this day-in-the-shade a wicked ribbin' (sic: ribbon). 15-11. A loss that really hit below the Beltway. , and Jen still had the legs to keep up. At halftime, Sludge was up 8-7. Sludge was certainly thinking we can win this one as HN was thinking cans, as in Coors. Sludge scored 15 points first so one could (politically) argue this definition of a "win." Truthiness here is Sludge had as many missed opportunities for victory as there were spent banana peels on the sidelines. You know the feeling of getting stiffed when splitting the dinner+drinks bill equally even though you weren't drinking?! Yeah, that happened to Sludge during this 16-17 loss. Games at 10am, Noon and 2pm. Saturday's game was a makeup of a canceled game earlier in the season. Despite the fact the game players were Friends of Pickup there was added stress to this game -- would Sludge be entering the postseason with a subpar record...? The longest game setup was aptly started with the longest first point. Meanwhile, based on the outdated mpg calculations, it took less than .85 of a point for cussin' Russ to do so. Sludge began spewing oZone, but by 3-3 (the game score & Sludge's record), a new standard was imposed - person D. EPA regulated Sludge's 1st half low emissions of cutting to the disc and high turnovers. Perchance, Sludge may have feared fines for dumping (& swinging). At the halfway mark, Sludge & EPA were in an old-fashioned horse race. At a boosted 79%, Sludge altered the throwaway mentality and showed positive environmental stewardship with not just one cut-catch-&-release, but another & another. No need to put Sludge on the endangered species list! Sludge won by an impressive 5 points and ended the season 1 game above .500. What a great way to end the season with a very good-natured game within the shadows of the WashMon. NOW onto the more important stuff...setting a date for the POOL PARTY! In quality satire, Colbert Report sheds some light [6:08 vid] on the Representative who proudly represents some our Sludgemates in the Commonwealth. Mom always said: "Never follow a school of fish into the Gowanus." But the delight people felt at the site was short lived. The 15-foot whale, nicknamed “Sludgie” by some, died after swimming into the shallow end of the canal near Clinton Street at 5 p.m. Wednesday evening. As this paper was going to press, officials for the National Oceanic and Atmospheric Administration were planning a necropsy for Thursday morning. Some, however, predicted that the exciting sight would have a sad end. “In general, when animals are unexpectedly in an area where they’re not supposed to be, they’re either following something like food or there’s something wrong with them,” Teri Frady, a spokeswoman for the National Oceanic & Atmospheric Administration told New York Newsday. The whale was first spotted Tuesday by workers at a waterfront cement company owned by John Quadrozzi Jr., who at first thought the canal’s latest attraction was a porpoise. “Then we could see he was much bigger,” Quadrozzi said. Officials from the U.S. Coast Guard and the New York Department of Environmental Conservation were called to see if Minke was in distress, but said that they didn’t see any signs of trauma. Crews stayed at the scene well into Wednesday, hoping that the whale would head out to open sea on his own. By the second day, there were growing concerns that the Gowanus’ latest tenant was having difficulty navigating the shallow waters. Witnesses saw the whale swimming around in circles trying to find a way out of the canal. Officials from the New York Aquarium in Coney Island speculate that Sludgie got stuck in Brooklyn after following a school of fish into the Gowanus.